Juliette Binoche won the Best Actress Award at this years Cannes Film Festival for her performance in this intriguing film. She does indeed give an amazing performance, able to change from comic face-pulling to quiet glances and watery eyes in an instant and displaying an openness throughout that is endearing and heartbreaking. It's interesting to read that the genesis of the film came when director Abbas Kiarostami told Binoche the synopsis for the film as an anecdote which she believed as true. He then confessed to having made it up but that willingness to believe is integral to the film he went on to make after several years of struggles to get production under way. One of the problems was to find the right man to star opposite her with several actors beginning to film or slated to do it, including Robert De Niro at one point, until Kiarostami came to direct an opera and worked with baritone William Schimell, later commenting, "When I saw him, I immediately perceived in him the strength, finesse and humour of the character." Perhaps only in the world of opera was he likely to find someone capable of switching from English to French to Italian with the ease employed by Shimell, but for a début film performance he acquits himself more than adequately, particularly opposite someone of Binoche's experience in what turned out to be a prize-winning performance. Why is the film so intriguing? Well, because it isn't easy to be sure of even the basic synopsis. In Tuscany a gallery owner (Binoche) meets an academic James Miller (Shimell) who is an expert on copies in art. He signs his latest book for her and then agrees to accompany her on a drive. Later they are mistaken for a couple and the pair pretend to have been married for many years and their dialogue plays with this very notion. If Miller's work concerns the ambiguities of original and copy, authentic and fake, then the conversation between the two of them covers similar ground with regard to relationships; what is real, what is pretend? In a village where a wedding is taking place the two of them converse, laugh, bicker and fight. Just like a real married couple. And this is where it gets tricky, because perhaps they are and those early scenes where they appeared to be meeting are in fact the false conversation, an elaborate piece of role-play for a couple whose marriage is fading. There is no definitive answer and my wife and I are still not close to agreeing with each other about what's closest to the truth (oh, the irony), which all goes to show how successfully Kiarostami has realised his original idea. This is not a film for everyone. It is simply shot with almost all the dialogue coming from the two stars and the language changing frequently. It is slow too, but you might be thankful for that as you attempt to piece together what's real and what's performance. I've been intrigued by notions of authenticity in fiction in the past and it was interesting to see them toyed with so effectively in film, the medium perhaps best suited to explore them. I saw some of Kiarostami's work in film school and was very taken with how very much he does with a bare-bones premise. His films seem to radiate with urgency even though they are completely controlled (with mostly static camerawork, if I recall). I'm also with your above commenter on the virtues of her performance in Three Colors: Blue. What's great about her performance there is that she is reserved when the script would seem to be calling for showy emotion and falls apart inexplicably. thanks for that. I seldom comment on your blog but enjoy every post. I have resolved to comment more often. Really enjoyed your reviews of the booker list by the way. But will wait till C is out in a sensible cover. 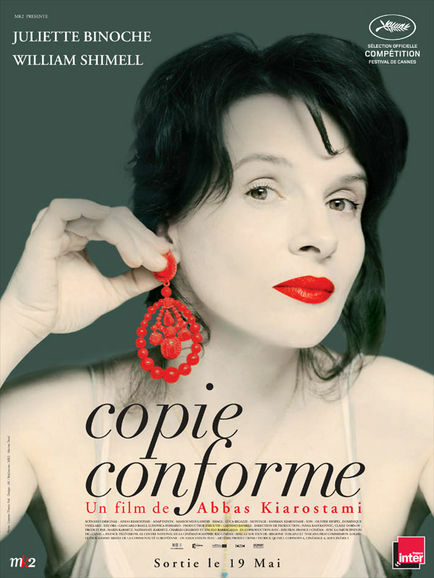 I'm a big fan of Binoche I have discovered recently. She seems to have a desire to push herself as an artist which saw her performing a dance piece with Akram Khan recently. On film, there's something utterly charming about her, a rare commodity these days, and she has an amazing versatility which I've hinted at in this review. It is mostly static camera work, as you mention Pen Name, and almost exclusively the two actors, just talking. Interviewed about it recently, Binoche said it's like watching an entire relationship condensed and played out in less than two hours. That goes some way to explain where the energy comes from in the film. It's intense. Thanks for commenting Philip, I look forward to more. There's an amazing review of C in the LRB right now which you can find here. If that doesn't make you want to read the book, complete with non-sensible cover, then nothing will.